In February 2009 a variation on the Lee-Carter model for smoothing and projecting mortality rates was presented to the Faculty of Actuaries. A key question for any projection model is whether the process being modelled is stable. If the process is not stable, then a model assuming it is stable will give misleading projections. Equally, a model which makes projections by placing a greater emphasis on recent data will be better able to identify a change in tempo of the underlying process. where the rates μx,y have been locally smoothed using a spline smoother with age-year penalties. The animation in Figure 1 shows how the rate of improvement by age has varied since 1962 (click the image to restart the animation). Mortality improvements are anything but constant, with considerable variation by both age and time. Mortality improvements are clearly a two-dimensional projection problem. Mortality improvements were negative for males in their late 20s and early 30s during the 1990s, presumably due to the emergence of the AIDS epidemic. The cohort effect for years of birth around 1931 is visible as a peak moving through the ages from 40 onwards. This generation has consistently experienced faster rates of improvement at all ages. Rates of improvement have accelerated over time for post-retirement ages. There are year-on-year fluctuations, but the overall trend is of ever-faster improvements. Improvement rates for the 1931 generation have accelerated from under 2% in the early 1960s to around 5% per annum most recently. 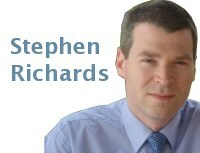 In the paper presented to the Faculty of Actuaries in February 2009, the Currie-Richards model projected stronger mortality improvements than the traditional Lee-Carter model. Figure 1 shows why: the Lee-Carter model implicitly assumes that the mortality-improvement process is stable, whereas the Currie-Richards model picks up on the fact that improvements are accelerating. This is particularly the case for post-retirement ages, as shown in the animation in Figure 2 (click on image to restart the animation).